So, aside from the most obvious Clown Prince of Crime who will undoubtedly come into play at some point, these are the 10 villains we most want to see take a major role in Batman: The Telltale Series. Starting off this list with possibly the most obscure entry is the anti-Batman villain, Wrath. Often depicted donning a colour-swapped version of the Caped Crusader’s costume, his most recent incarnation has him decked out in intimidating metallic armor. Though his costume has changed in his various manifestations over the years, his alternate origin remains more or less the same as a mirror to Batman’s own. The son of criminals killed in a shootout with the Gotham City Police Department, he grows up to seek his own brand of vengeance by attacking and killing cops as Wrath. Serving as a twisted version of our hero’s own familiar war on crime, Wrath is the perfectly outlandish, yet still oddly sympathetic foil to Batman. One of Batman’s oldest adversaries in the comics, Doctor Hugo Strange is most well known for being one of the few to deduce his secret identity. A renowned psychologist, Strange first analyzed Batman from the shadows, inferring exactly what it was that made the Dark Knight tick. Eventually this examination turned to obsession, and Strange revealed himself as a maniacal scientist with plans to defeat Batman and take his place. While most villains use their own physicality or overwhelming amounts of henchmen to subdue the Bat, Strange is one of the few that can hurt Batman where he’s most vulnerable – his own mind. Like Wrath, Hush is another reflection of Bruce Wayne, with an alternate form of the events that shaped young Bruce Wayne’s life. Once Bruce’s childhood friend, Thomas Elliot’s parents were also the victims of catastrophe, though secretly at the hands of their own hateful son. Despite his father dying in a sabotaged car crash, Thomas’ mother survived due to Bruce’s father’s skills as a surgeon, an act that Elliot resented against the Wayne’s for all his life. Growing up to become a masterful surgeon himself, Elliot takes the guise of Hush to wreak vengeance on Bruce for the deeds of his father, using a genius intellect to formulate schemes involving all manners of Gotham’s famous villains. His operating skills also prove to be one of his greatest assets, transforming his own face to suit his needs at will, as well as performing surgical operations with impeccable precision on others. Hush may appear faceless, but he nonetheless serves as a powerful reminder of Bruce Wayne’s past and a dark, alternate path he could have taken. Originally serving as a lower henchman, Pyg has gone one to become known as a mainline solo villain, recently having his own string of side missions in Batman: Arkham Knight. Despite his seemingly innocuous appearance, Professor Pyg may actually be one of the more horrendous foes Batman’s come up against, utilizing a creepy league of minions to act as his slaves. The “Dollotrons”, Pyg’s kidnapped victims, are put through a mysterious and harmful process, leaving them mind controlled. Surgically attached to irremovable masks, they follow his awful bidding as his own army of horrifying “dolls”. Over the years, Batman has been at odds with numerous deranged adversaries, but Professor Pyg stands above as one of the most disturbing, as he’s forced to fight through hordes of innocent victims he failed to save. Since Bane’s explosive first appearance where he succeeded in “breaking the Bat”, it’s unfortunate that he’s hardly achieved that height of mastermind success again. Born in a Mexican prison, Bane spent his days training his body as well as his mind to perfection, while also continually plagued by a fear of a bat creature in his dreams at night. Using the strength-enhancing drug Venom, he eventually manages to escape into Gotham, where he’s most renowned for devising a scheme to end Batman. At first physically and mentally draining him, Bane is able to solve his identity of Bruce Wayne, before sneaking into Wayne Manor to break his target’s back. Since then, Bane has never truly been a powerful force against Batman, even neglected to simple boss fights in the Arkham series. It’s about time Bane makes his return as the ultimate force to be reckoned with, as both the undefeatable strength and powerful mind that first brought Batman to an end. The most recently debuted villains on this list, and already considered a staple of the Batman mythos, the Court of Owls is a secret society intrinsically connected with Bruce Wayne’s history. Hundreds of years old, the Court has secretly held immense power over Gotham from its development in Colonial times, pulling the strings behind its largest developments. Their influence is maintained through its members consisting of old and wealthy families, as well as a breed of secret assassins at its command. The Talons, seemingly immortal killers that have undergone intense physical and mental training, serve as their weapons used throughout time through temporary stasis and resurrection from the Lazarus Pit. Once thought to have arranged the deaths of Bruce Wayne’s parents, Thomas and Martha Wayne, Bruce has tracked down the mysterious society since boyhood, always believing in the myth of the Court of Owls. The most notorious assassin in DC continuity, Slade Wilson A.K.A. Deathstroke has clashed with countless heroes aside from Batman, including Nightwing, Green Arrow, and the Teen Titans. Initially a soldier of the U.S. military, Wilson underwent secret experiments to gain a number of superhuman abilities, before going rogue as a mercenary-for-hire. Due to his lack of true allegiance, he’s faced off against heroes and villains alike throughout his career, always feared for his impressive array of combat abilities. Ultimately, it’s these skills that make him a perfect adversary for Batman, with both foes at the height of human capability. Their equal footing in battle allows for Deathstroke to put up some of the most grueling and intense matches in Batman’s career. 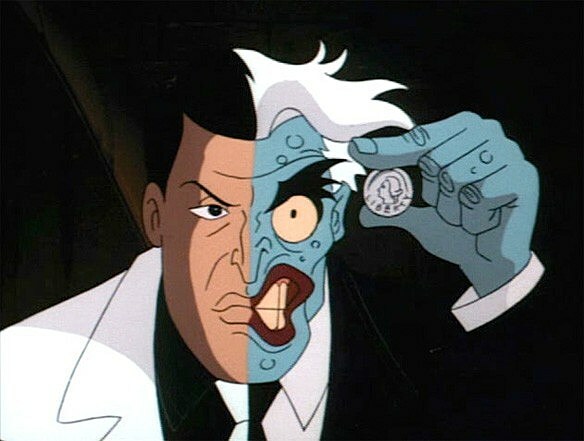 Harvey Dent is already known to make an appearance in the game, but how much of a role he plays and if his alter ego of Two-Face will surface remains undisclosed. After the Arkham series’ sparing use of the character, it’d be satisfying to see Two-Face in a more prominent role in Telltale Games’ installment. His misuse in the Arkham games is especially disappointing due to his tragic backstory and history with Batman. Originally the district attorney of Gotham, he was actually one of the few bright spots in Gotham’s justice system that Batman could turn to. After a convicted mobster throws acid on Dent in court however, his left side is horribly mutated and he’s quickly driven mad with his new dual identity. It’s this origin in justice and righteousness that makes Two-Face so interesting, as Batman attempts to save his old friend from his insanity and bring back the good man he once knew, while also having to deal with his over the top double-themed plans. Much like Two-Face, Riddler has been neglected to a side-villain for years, only serving as a catalyst for collectibles in the Arkham series. However, there’s no denying that he’s always an entertaining villain for Batman, and one who desperately needs to have more of a spotlight shone on him. The victim of parental abuse as a child, Edward Nygma grew a desire to prove himself over others, even if it meant he had to cheat to obtain superiority. And it’s this narcissistic and compulsive need to prove his intellect over others that makes him so amusing when paired up with the world’s greatest detective. Despite the hilarity of the Riddler’s anguish over his convoluted plans being solved by Batman, in a closer examination, it’s actually a sad view of a man plagued by a variety of mental ailments that he tirelessly acts upon. Telltale Games may just have the right expertise to illustrate this often ignored aspect of an often undeveloped character. Okay, I know what you’re thinking, but hear me out – this could really be a new revitalization for the character if done right. Previously, Mr. Freeze was only a silly C-tier cold-themed villain before Batman: The Animated Series made him one of the most sympathetic of his rogues’ gallery. Scarecrow was a dorky guy with a bag on his head before Arkham Asylum redesigned him with an actually frightful appearance, and again in Arkham Knight as a truly intimidating primary villain. Now it’s time for Telltale Games to make its mark on Batman history by taking up the greatest challenge yet, giving the Condiment King a tragic and intriguing backstory along with a cool new redesign for the modern age. He’ll of course have to keep his iconic ketchup and mustard guns, perfect for spraying a new brand of terror on the bun of Gotham City. Hush and the Court of Owls would be incredible! Great writeup, have you featured your writing on any other gaming websites before? Yeah I really hope they branch out with some of the more obscure villains. And thanks! I haven’t written for anything else yet, that’s definitely something I should look more into soon.